Nick Wall has spent over four years gathering traditional music from every country in the world, from Kazakhstan to Kiribati, researching the life and culture of these countries, then weaving the music in with information, stories, and reflections about each country. 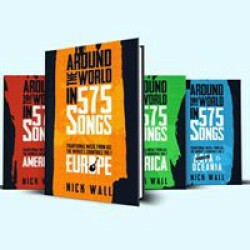 Around the World in 575 Songs: Traditional Music from all the World’s Countries is a festival of cultures in four volumes; a demonstration that for many people in this globalised world our roots are still a vital part of who we are; and an affirmation that every country and every people are special. Never before have so many stories been gathered together in one place of the struggles by musicians around the globe to keep traditional music forms and traditional instruments alive. These volumes are a vital resource, and a well of inspiration.